Christen focuses her practice on commercial litigation and business disputes. Her extensive litigation experience enables her to effectively advocate for her clients throughout all stages of litigation, including pre-litigation counseling, pleadings, discovery, dispositive motions, and trial. She has experience researching complex legal issues, drafting motions and briefs, and managing the discovery process. Christen’s proactive and practical approach enables her to achieve efficient solutions for her clients. 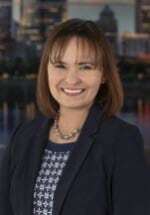 She has represented clients in a wide array of cases, including those involving breach of contract, trade secrets, unfair competition, shareholder/partnership disputes, personal injury, and insurance coverage disputes. She also has experience in temporary restraining order and injunction matters. She has first-chaired a jury trial in federal court, and she has second-chaired both bench and jury trials in both Ohio and Kentucky. Additionally, Christen is an adjunct professor at Chase College of Law. She teaches first year legal writing. Prior to joining BHMK, Christen practiced for five years in Cincinnati. She has also clerked in the Eastern District of Kentucky for Senior Judge William O. Bertelsman and Magistrate Judge Candace J. Smith. Before joining the legal profession, she also worked in sales for a small business, giving her unique experience with small businesses and the issues they face.